With the arrival of a new year, I will be working more and, therefore, less available to post to this blog or to comment on yours. I will limit myself to posting some of my artistic 'works in progress', and perhaps the occasional thought or poem that inspires. While I will try to keep up-to-date with your postings, I will be doing my best to resist the impulse to comment. (We'll see how long I can stick to that resolution!) 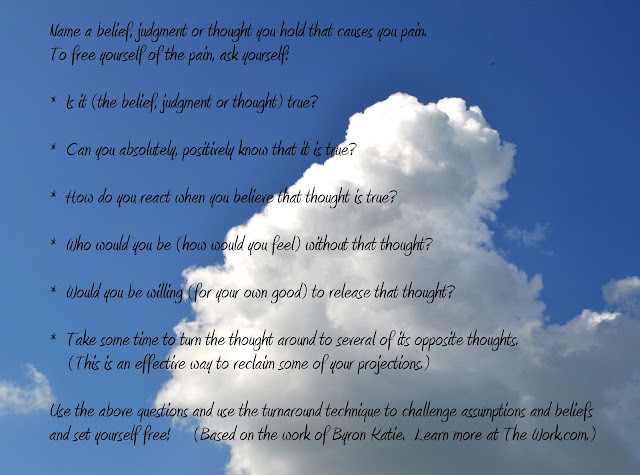 In the meantime, I leave you with one of the best gifts I ever received: Byron Katie's set of questions (modified a bit by me) that you can use to set yourself free from limiting, painful beliefs and assumptions. Be well - and I'll be around. And miles to go - the course is steep. And miles to go - must make that leap. I know I speak for many others when I say that you will be sorely missed, Bonnie. I wish you the very best in the coming year and look forward to whatever postings I discover here at the Original Art Studio. It won't be the same without hearing your voice every day or so. By the same token, I respect the need of everyone to do what he or she needs to do from day to day, month to monty, year to year. Good luck and know that you have a friend over here at Transit Notes. Thanks for the Byron Katie gift and keep those promises! Have fun - shall miss you but look forward to an occasional visit when you have time. Thank you for leaving us with such great word. all the best to you on your journey - nice to know you'll be with us in spirit! Bryan Katie's questions are much like the methods I use to change a belief about something that I feel emotional pain about. Thanks for his, which gives me other ways to think about it. I will miss your presence very much. Whenever you do post or come around, I look forward to "being" with you. I wish you abundance and joy in these days. I understand the need to put a boundary around the impulse to blog——and have struggled some myself with this——but I've managed to make more time for life offline, a good thing. I hope you find the right balance and that it will include the inspired posting and the occasional thoughtful comment. I know you will be missed by many and by me. Ah, I completely understand and wish you well with your work in the New Year! Will look forward to your return as time allows. Life and living do get in the way of our desire to spend hours in creative pursuits and helping others. Thank you for the many moments and encouraging words you have posted in my comments and in my heart. You will remain on my list of blogs to visit. My list isn't going anywhere and doesn't have any responsibilities. So, I will be here. Wishing you well in the year ahead and I hope you keep living as stress free as possible. I wish you all good things as the year starts off and you take the momentum to do the offline things you need to engage in. I'll know you're around even if we don't hear from you for stretches of time. Imagine me waving from over here on the western edge of the continent, a 'hello' and good-wish all rolled into one and sent your way. It was great to visit you again, Bonnie. Life is busy. We do have much to do in our lives. I know the feeling, especially lately. I look forward to your postings, even if not as often. Wishing you the very best in your work and in your creativity!!! My first response: Oh No! No Bonnie?!?! I'm limiting myself as well to the many blogs I enjoy reading and commenting on. I have work to do as well, and the more I visit and chat, the less I have to create! I'll see how long that lasts...in the meantime I'm so glad to have connected with you and look forward to seeing and reading your beautiful art and transpiring words when you do post. A time for work and a time for play. I have enjoyed your posts and I have a little one at home so this has been a balm to me. :) But I am glad you will be posting art work here! I will look forward to that. Wherever you go, may the wind continue to push the sails of your boat and may you encounter a safe port wherever you moor. You're worth waiting for, Bonnie. I think blogging has an ebb and flow for most of us - I have admired your ability to juggle many balls for some time now and completely understand your need to reduce your focus. We'll still be here whenever you pop up. I am sure we will be in touch, Bonnie. I certainly know how hard it is to manage work, family and blogging, and am not unfamiliar with long spells of not writing or commenting. You are such a consistent, almost daily blogger, and engaging and engaged commenter, something I have long admired and appreciated, but been unable to emulate in my own commenting and responses. You and your Original Art Studio are such bright spots on my blog landscape. I trust those lights may flicker a bit, but not go out. I didn't send you my sincerest wishes for this transition to still feed your soul enough and all that, and twice today I was unable to come here and thought you'd actually shut down the place. Strange google glitch I guess. the best to you in this , Bonnie, and I certainly have many of your archived posts to catch up on. hey, lookie there! Someone's playing with cool layout changes! I'll bet most people haven't noticed yet because you haven't put up a new post, so may I be among the first to tell you that I think it looks great! I am missing you. . . but this is an important post to leave up for a while.